Time to sell your Sea Horse condo? Read about today's resort-market condo buyer. 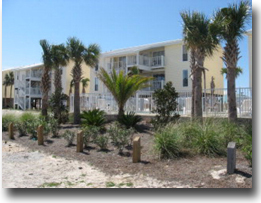 Sea Horse condominium is another condo located in the West Beach area of Gulf Shores, AL and sits on Little Lagoon with deeded beach access. The condos at Sea Horse are across the street from the Gulf of Mexico and many of the condos have gulf views, indirect gulf views or great views of Little Lagoon. The property has an outdoor pool, BBQ area and is conveniently located to downtown Gulf Shores. The condo consists of 24 units built in 1983. All of the condos in Sea Horse are two bedroom units and the floor plans range in size from 700 to 850 square feet. If you have any further questions, need info or would like to schedule a private viewing for Sea Horse condominiums in Gulf Shores or any other condo or property, please email info@condoinvestment.com or call (251) Area-Pro (251-273-2776) for immediate assistance. Read these RENTAL TIPS for ways to increase your Sea Horse rental revenue. Find additional info for annual rental incomes at Sea Horse and other Gulf Shores & Orange Beach condos.